In her autobiography, Just Kids, punk rock goddess/pioneer Patti Smith writes that she made more money selling the records she received to review than she did writing the actual reviews. Why? Smith explains that she centered on "obscure" musicians and wasn't so much interested in criticizing as she was in alerting her readers to important artists that were overlooked. Her role was not to tear down but to offer an alternative to corporate messaging and spoon-fed music consumption. It wasn't exactly mainstream material. 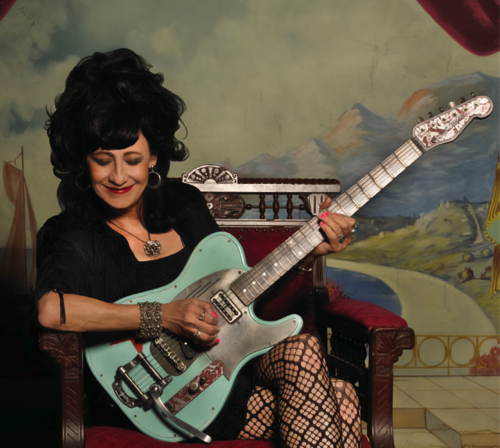 Rockabilly favorite Rosie Flores has just released Working Girl's Guitar on Bloodshot Records, and she is an important artist who should not be overlooked. This is Flores' 11th album and comes just weeks after her stint as producer and performer on the posthumous Janis Martin album, The Blanco Sessions. Working Girl's Guitar showcases Flores' substantial abilities as a producer and guitarist in one of the cleanest productions audiophiles will hear this year. Listen to the title track here. While not exactly "obscure" in the sense that Patti Smith writes about, Flores has certainly been overlooked in an evolving music business that has streamlined label rosters to include only the most commercially viable artists. In fact, Flores honed her considerable talent at North Hollywood's Palomino Club (think country music west) in the '80s following the leads of Linda Ronstadt, The Flying Burrito Brothers, Dwight Yoakam, Merle Haggard, Jerry Lee Lewis, Freddie Brown and just about every big country name you can conjure. They called it "Cow Punk" back then, and now "New Traditionalist" is the preferred promotional language along with "alt country" and "roots rock." I was lucky enough to be introduced to Flores back in 2009 at Austin's Saxon Pub when I was doing a presser for pop princess Susan Cowsill. The two were swapping tales about working the Palomino Club "back in the day." 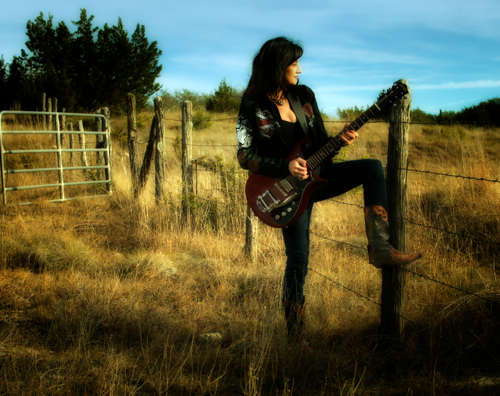 I'm an unabashed fan, so roots writer credentials aside, don't take my word for the fact that Rosie Flores is one of the best guitar players, performers, writers and producers ANYWHERE. The prestigious Oxford American "Southern Magazine of Good Writing" has better and more prestigious cred (I'm no Patti Smith) and they love Rosie. Flores can... belt with the best of 'em and wields her token blue guitar with deadly precision... she's is an all-around force... In Working Girl's Guitar, though, she demonstrates her versatility as a musician and songwriter. The album floats from rockabilly to surf rock to bluesy love ballad and back, all while achieving a cohesiveness that would be difficult even in a less-ambitious album. The opening track, written for her by friend Ritchie Mintz, takes its name from a battered guitar Flores was considering selling when times were tough. Mintz commented that it looked like a "working girl's guitar," and the album title was born. While visiting Nashville last week to hang out with sound guy Ramcey Rodriquez on the roots scene for a night, I asked him if he would take a listen. I was stunned by the crisp production, especially since I knew the album was recorded at two studios. Ramcey (Songpoets Sound) specializes in live sound, recording, and is a mastering engineer from Nashville. He knows good sound and how to get it. His first comment was that "Rosie sure sounds like a girl who knows how to work that guitar." "That guitar" is Flores' trademark James Trussart Deluxe Steel TopCaster. Ramcey had it right. The signature SteelCaster tone comes from the special hollow steel body, but Flores coaxes a unique universe of resonance and tone with notes that soar. That girl can play and this album delivers the sound, consistency and ambience of a live performance. Ramcey suspected right away that Rosie's main vocals were recorded at one studio with one very good microphone and that the additional vocals and overdubs were done at the second studio, resulting in the crisp, clean sound that is the hallmark of this record. Wondering how the engineers achieved this, we asked the guys via an email to Josh Zanger over at Bloodshot Records. Mark Stockert at Underwood Studios in Minneapolis says he used the "finest vocal microphone ever made;" the Wunder Audio CM7 tube microphone. For any audiophiles who may be reading this, Stockert reminded us that the "vocal chain" was the most important factor in capturing Flores' great vocals. The pre-amp they used was a Great River MP-2NV; "wicked for multitracking." Cris Burns engineered at Austin's Summit Street Studio where Flores finished up the remaining vocal and guitar overdubs. He used an Audio-Technica 4033 microphone and a Cris Burns Audio handmade tube preamp. Here is where Flores shined as a producer. She knew where to get the engineering talent to reproduce her sound and this album is a true representation of her craft. There are many gems on this record, and a couple of surprises. Sixties teen heart throb Bobby Vee sings back-up on "Love Must Have Passed Me By" (Robert Thomas Velline/Salma Music/BMI) and Flores' acoustic guitar track on George Harrison's "While My Guitar Gently Weeps" (Harrisongs Ltd./Ruminating Music/Wixen Music) is a standout that Flores makes her own. "I'm Little But I'm Loud" (Pink Suede Music) is pure Rosie Flores fun and a solid girl's co-write with Rachel Gladstone. There is much to love on this CD and here is hoping it gets the play it deserves on Americana and Roots Radio outlets. Rockabilly fans will already have this CD in their collections. Once you have this CD, new fans will want to catch Rosie on tour. More details can be found on the Rosie Flores webpage. Cross posted at Hollywood Progressive.